Is there anything that tastes better than a hot, homemade tortilla? We don't think so. Now you can make your own with our instant Maseca masa mix, tortilla press (tortillero) and 17" comal. With the enclosed Tortilla Lovers Cookbook you'll be able to make an array of innovative and delicious tortilla-based dishes. Also included a styrofoam tortilla warmer. MexGrocer brings authentic Mexican food to your home! Todo lo que se necesita para convertirse en un experto en la preparación de tortillas se encuentra en este paquete de regalo. Una tortilladora o prensa de masa para hacer auténticas tortillas, Harina para Tortillas de Maiz Maseca, un comal ovalado grande, un libro con recetas para los amantes de las tortillas y un tortillero para mantener las tortillas calientes. 7 3/16" x 8 1/4"
so far everything has been great. My husband & I are having a wonderful time making our own tortillas, tacos, tostadas & enchiladas. So much tastier than premade tortillas & easier than I thought it would be. A delicious way to use up leftover meats, veggies and bits of cheeses. Very happy with both the products and the great customer service from mexgrocer.com. Does what it is supposed to. The press takes a few tries to get used to, but once you have the right consistency in the dough and the right amount of dough in the press, it all comes together. Love the kit. I gave it to my daughter for Hanukkah and she loved it. Great! The press works especially well - if you put waxed paper down on the top and bottom of the tortilla. No sticking then. Also, rotate the tortilla as you press it to make it even. Otherwise the side near the hinge is very very thin. The keeper also works to keep pancakes warm! The platter will be most useful this summer on the grill since I have a griddle for cooking. Over all, very satisfied. Nothing like fresh corn tortillas with your meal. I had always wanted to make my own corn tortillas. This kit was terrific! It was an easy process, too! I used the comal on the burners of my stove and made the tortillas right next to it. It wasn't long before I was managing an assembly line of press, cook, press, flip, and add another. It was fun. The taste of fresh, warm, homemade corn tortillas was a real treat. My family definitely liked them better than the store-bought ones. 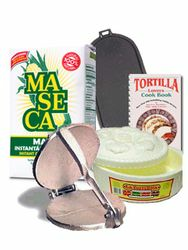 I would recommend this gift pack to anyone who enjoys corn tortillas.